In this page, we will prove that in a parabolic mirror, given that an incoming ray of light parallel to the axis gets reflected through the focal point or focus, the angle of incidence and angle of reflection are congruent. In the diagram above, we have an incoming ray, R, getting reflected off of the parabolic mirror with equation y^2=4px at point A. 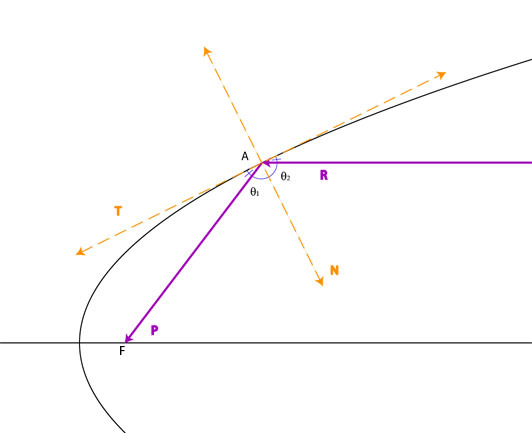 The focal point is labeled F on the axis, while the ray from point A to the focal point is labeled P.
The tangent line to the parabola at point A is denoted by T.
The normal line through point A is denoted by N.
Point A has coordinates (x,y) and point F has coordinates (p,0). Let Θ 1 be between rays P and N and Θ2 be between rays N and R.
Since R is simply a horizontal ray, we can assume that it is a unit vector without loss of generality. That is, R = <1, 0>. N will represent the normal line. However, before we can write the normal in terms of a vector, we must first calculate its slope. Hence, we will first calculate the slope of the tangent line by taking the derivative of the parabola at point A. 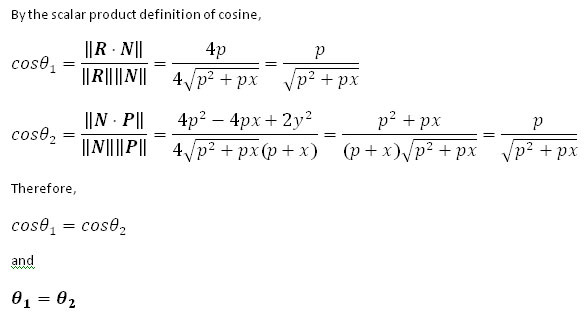 This yields a slope of 4p/(2y). Then, to get the slope of the normal line, we take the negative reciprocal of the slope of the tangent line. This yields -2y/(4p). Now that we have the slope of the normal line, we can write it into vector form. If we treat the numerator as the "rise" (y-component) and the denominator as the "run" (x-component), we will get the vector <4p, -2y>. Thus, N = <4p, -2y>. P represents the ray from point A to the focus. In order to obtain the vector slope, we must find the slope of the line segment first. The slope is equal to the difference in y-values over the difference in x-values. Thus, we get P = < p-x, -y>. Hence, we get the following vectors. Thus, the angle of incidence, Θ2 and equal to the angle of reflection, Θ 1.